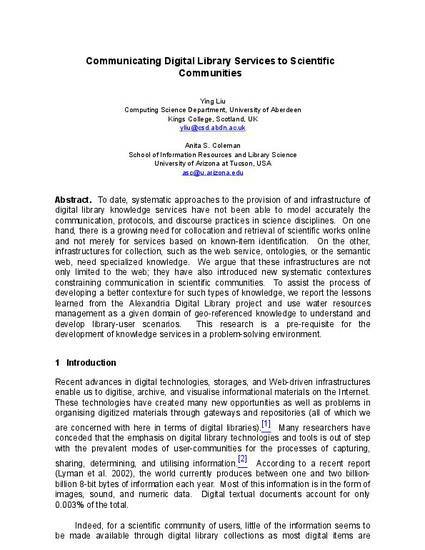 To date, systematic approaches to the provision of and infrastructure of digital library knowledge services have not been able to model accurately the communication, protocols, and discourse practices in science disciplines. On one hand, there is a growing need for collocation and retrieval of scientific works online and not merely for services based on known-item identification. On the other, infrastructures for collection, such as the web service, ontologies, or the semantic web, need specialized knowledge. We argue that these infrastructures are not only limited to the web; they have also introduced new systematic contextures constraining communication in scientific communities. To assist the process of developing a better contexture for such types of knowledge, we report the lessons learned from the Alexandria Digital Library project and use water resources management as a given domain of geo-referenced knowledge to understand and develop library-user scenarios. This research is a pre-requisite for the development of knowledge services in a problem-solving environment. This article was originally published in LIBRES: Library and Information Science Research e-Journal, volume 14, issue 1, and can be found at this link.